Cheongju International Airport (Hangul: 청주국제공항; Hanja: 淸州國際空港; Revised Romanization: Cheongju Gukje Gonghang; McCune-Reischauer: Ch'ŏngju Kukche Konghang) (IATA: CJJ, ICAO: RKTU) is an international airport in Cheongwon-gu, South Korea. 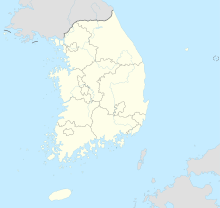 It also serves the cities of Daejeon and Sejong. In 2011, 1,337,791 passengers used the airport. It also houses the 17th fighter wing of the ROKAF. There is a railway station next to the airport, called Cheongju Airport station, which is on the Chungbuk Line. Cheongju International Airport is located at Ipsang-ri (a township), Naesu-eup (읍; town), Cheongwon-gu, Cheongju, Chungcheongbuk-do. A railway station is located nearby. It opened as a military airbase in September 1978, and in 1984, international airport construction began. The construction was completed on December 1996, and it was opened as Cheongju International Airport on April 28, 1997. During the mid 80's, Cheongju was selected as a possible site for Korea's main international airport before Incheon became the preferred location. It can process 1.23 million people from domestic flights and 1.15 million people from international flights annually, and the parking lots can hold 770 vehicles. In addition, airplanes can operate 196,000 times a year. There used to be flights to Busan and Saipan, but they were stopped due to low ridership. Currently, there are domestic flights to Jeju and international flights to China, Japan, Taiwan, and Thailand. It has a facility for parking 1,100 vehicles directly opposite to the passenger terminal. The facility is open between 6:30 and 22:00. ^ Airport information for RKTU at World Aero Data. Data current as of October 2006. ^ a b Jeju Air adds Osaka – Guam service from late-July 2018 Routesonline. 16 May 2018. ^ "Jeju Air expands Taipei network from late-Dec 2018". Routesonline. Retrieved 15 November 2018. ^ "Jeju Air plans 2 new routes in 1Q18". routesonline. Retrieved 30 November 2017. ^ "Jeju Air plans Cheongju – Bangkok service in W17". routesonline. Retrieved 8 December 2017. ^ 2018, UBM (UK) Ltd. "Jin Air adds Cheongju – Taipei charters in Nov 2017". ^ a b Liu, Jim (24 March 2017). "Yakutia adds scheduled Cheongju service in S17". Routesonline. Retrieved 24 March 2017. This page was last edited on 15 April 2019, at 13:43 (UTC).